KAUAI, Hawaii, Aug 10 2012 (IPS) - As construction of a hotly contested naval base on South Korea’s Jeju Island advances, there’s a showdown underway. Korean groups, increasingly aided by sympathetic outsiders, are protesting the base which they say is being built in Gangjeong village under pressure from the United States. But the latest battle isn’t between base protestors and Korea’s military or police, it’s between the International Union for the Conservation of Nature (IUCN) and those opposing its upcoming Sep. 6-15 World Conservation Congress (WCC) at Jungmon resort, seven km from Gangjeong. Jeju, home to multiple UNESCO World Heritage sites and numerous other environmental and cultural special status designations (see side bar), is taking on new strategic importance as regional military powers and the United States, which maintains dozens of military bases in South Korea, Japan and Okinawa, vie for dominance in northeast Asia. The naval base at Gangjeong, which Seoul said will also have civilian uses, is expected to accommodate submarines and up to 20 warships, including U.S. Aegis-equipped destroyers which opponents say will make the island less safe, not more. For five years, Gangjeong has been the site of daily protests and frequent arrests. Now, just weeks before the Congress is to begin, conservationists, academics and NGOs are challenging the IUCN. In mid-July 55 Korean environmental and civic groups sent a memo to the IUCN asking it to clarify its position on at least half a dozen environmental issues including the naval base while strongly criticising the decision to hold the Congress on Jeju. Jeju Island: What’s at stake? 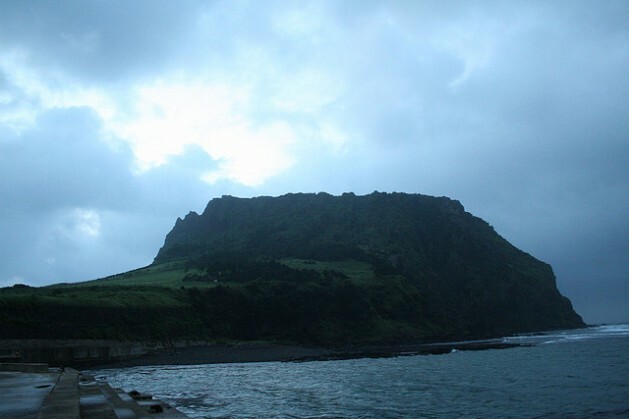 From a history marred by one of Korea’s worst military massacres (1948-1954) in which an estimated one-fifth of the population was killed, to being dubbed an “Island of Peace” in 2006, Jeju is gaining increasing global recognition for its natural beauty, unique geology and rich biodiversity. Jeju island, 80 km southwest of the Korean peninsula, is South Korea’s only Special Self-governing province and the first place in the world to receive all three UNESCO natural science designations (Biosphere Reserve in 2002, World Natural Heritage in 2007 and Global Geopark in 2010). Volcanic Jeju was recently named a New Seven Wonders of Nature site in addition to having a number of other environmental and cultural designations. But conservation and civic groups, NGOs and scientists familiar with Jeju’s fragile ecosystems say the island’s nature and culture are threatened and the Korean peninsula destabilised by the naval base under construction at the southern village of Gangjeong. That base, designed to berth up to 20 warships including U.S. Aegis-equipped destroyers, opponents argue, will imperil rare wildlife, destroy natural areas that currently enjoy special protected status and irrevocably alter local culture and livelihoods. Base opponents from Catholic nuns and scientists to grassroots organisers and even Gangjeong’s mayor himself have been arrested and brought to trial as they decry the destruction of a lava coastline, a rare rocky wetland, freshwater springs and coral reefs which are being blasted and covered with concrete caissons. They point out the rarity of these habitats and list plants and animal whose homes are being irrevocably transformed to make way for the base. These species include bottle-nosed dolphins, narrow-mouthed toads, red-footed crabs, Jeju freshwater shrimp and dozens of species of soft coral. Besides coastal and marine life, critics charge construction of the base and new military housing is leading to the seizure of farmland and the end of a hundreds-of-years-old way of life based on farming, fishing and traditional subsistence diving by Jeju’s iconic haenyo women divers who symbolise an island people that prided themselves on living in balance with their environment. A second group, Jeju Emergency Action Committee, submitted an open letter to the IUCN calling for the postponement or relocation of the Congress unless base construction is halted. One of the authors of that letter is Jerry Mander, founder and co-chair of the International Forum on Globalization. He said the South Korean government’s support for the base, next door to the event, defies the IUCN’s historical purpose. He contends the IUCN is being “nice” about the base just to act like “grateful guests”. “I think the IUCN’s willingness to praise its financial sponsors while, next door, the sponsors undermine the entire purpose of the IUCN is unforgivable,” Mander told IPS. The IUCN has confirmed that Samsung C&T and Hyundai are among sponsors helping the South Korean government offset the cost of hosting the Congress. Critics are quick to note that Samsung is the lead contractor at the base and Hyundai Heavy Industries is working with Lockheed Martin to produce the Aegis Combat System to be deployed on U.S. warships at the Jeju naval base. Opponents say holding the WCC so close to the site of the disputed development and its associated protests, arrests and a police crackdown on groups fighting to protect the environment is in direct conflict with the IUCN’s stated aim to “improve how we manage our natural environment for human, social and economic development”. In an interview on Korean television, Marton-Lefèvre explained that IUCN’s vision is “a just world that values and conserves nature” with a mission to “influence society based on good science to conserve nature and natural resources in an equitable and sustainable manner”. Kidd said it’s important that the WCC, which is held every four years, remains on Jeju. “We want (the base) issue, with all the people involved, to be discussed at the Congress…in a very open, pragmatic, structured way.” To postpone or relocate the Congress, Kidd said, would not be good for people affected by the Gangjeong base or other environmental issues in Korea. “Part of the benefit of the Congress is that (as) a movement to be more sustainable and environmentally conscious, (it) spills over to the place where the Congress is held. We’ve seen that going back decades,” Kidd said. With between 8,000-10,000 attendees (about half from IUCN member organisations) at the quadrennial gathering, Kidd said the Congress provides an important venue to discuss the Gangjeong base and other issues. Sung-Hee Choi, who has been actively protesting in Gangjeong since 2009, told IPS she also wants IUCN members to see the culture and environment whose existence she said is threatened by the base. Choi, who was photographed lying on the ground to block a bulldozer with her own body, argues Jeju is not only ecologically and culturally sensitive, but filled with spiritually important sites. Another protestor, Jung-Min Choi from Seoul, has been arrested three times in Gangjeong. She told IPS that even if the IUCN doesn’t postpone its meeting, she wants it to include a statement about the impact of the base in its final resolution. The theme for this year’s World Conservation Congress is ‘Nature+’ which the IUCN said is “about boosting the resilience of nature – improving how quickly nature and people adapt to change”. As construction of the naval base in Gangjeong continues to alter the human and natural landscape of Jeju, many fear nature’s resilience is no match for the military and they’re pleading for help.